Wells Fargo, Chase, Bank of America, Citibank Hours: Banks Open on Christmas Eve? On Christmas Eve, a number of banks will be open, including U.S Bank, Capitol One, HSBC, and TD Bank. Wells Fargo: Closes at 2 p.m.
Bank of America: Closes at 3 p.m.
Citibank: Closes at 2 p.m.
Chase: Closes at 3 p.m.
Capitol One: Closes at 2 p.m.
HSBC: Closes at 3 p.m.
TD Bank: Closes at 3 p.m.
SunTrust: Closes at 2 p.m.
PNC Bank: Closes at 2 p.m.
BB&T: Closes at 2 p.m.
BBVA Compass: Closes at 1 p.m. Regions Bank: Closes at 12 p.m. These banks won’t be open on Christmas Day. Walmart: Open Christmas Eve until 8 p.m., but all stores closed Christmas Day. 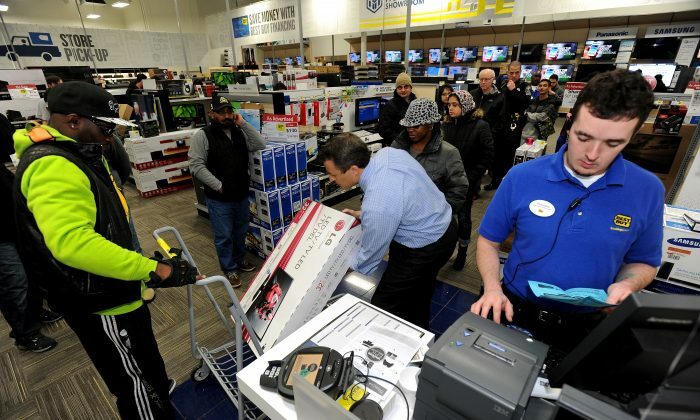 Best Buy: Store hours will be from 7 a.m. to 6 p.m. The store will be closed on Christmas. Costco: 9 a.m. to 5 p.m. on Christmas Eve. Closed Christmas. Kmart: 6 a.m. to 10 p.m. Christmas Eve. Closed Christmas. Lowe’s: The store will be open Christmas Eve. Check local listings for hours. Closed Christmas. REI: Open Christmas Eve; check stores for hours. Closed on Christmas Day. Gamestop: 8 a.m. to 8 p.m. Closed Christmas Day. Barnes & Noble: 8 a.m. to 6 p.m.
Target: Open 7 a.m. to 9 p.m. or 10 p.m. on Christmas Eve. Check store hours for local listings. Closed Christmas. Staples: Open Christmas Eve until 7 p.m., closed Christmas Day. Whole Foods: Open from 7 a.m. to 7 p.m. Christmas Eve; closed on Christmas. IKEA: Open from 10 a.m. to 4 p.m. but closed on Christmas. Toys “R” Us: Toys “R” Us has been open 24/7 for the past several days and locations close Christmas Eve at 9 p.m. Closed on Christmas Day. GAP: Closed Christmas Day, open Christmas Eve until 8 p.m.. Check local listings for hours. Macy’s: Open 7 a.m. to 6 p.m. Christmas Eve; closed Christmas Day. Home Depot: Closed on Christmas, open Christmas Eve. Check local listings for hours. Starbucks: Coffee purveyor Starbucks will be open on Christmas Day and Christmas Eve. Local store hours will vary. CVS: Most locations open Christmas Day; some are open 24 hours, which are regular store hours. Denny’s: The restaurant chain will be open Christmas Day. McDonald’s: A large number of locations are open on Christmas. IHOP: A large number of locations will open on Christmas. 7-Eleven: The chain will be open on Christmas with the same hours as usual, which is 24/7. Rite Aid: Will be open Christmas Day. Regular opening and closing times. Family Dollar: Will be open on Christmas Day. Regular opening and closing times. Circle K: Stores will be open on Christmas Day, most operating with regular hours. QuikTrip: Stores will be open Christmas Day, with most operating with regular hours.